As a patient of Grace Hospital, or the loved one of a patient, it is our goal to help you understand the continuum of care from the acute care hospital setting to Grace Hospital, a Long Term Acute Care Hospital (LTAC). We want to provide education to you in regards to both the patients and families expectations. As a family member, or loved one, your involvement in the recovery and healing process is very important, as the average recovery time in an LTAC is usually weeks not days. You provide support to the patient, as do the interdisciplinary team of Grace Hospital, and it is important to keep the lines of communication open. Our physicians and staff work with you by helping you understand your loved one’s prognosis and plan of care during their stay with us. We invite you to attend the weekly “patient care team meetings” to assist in this process. It is important to remember that our patients tend to be very ill, and while our ultimate goal is to return the patients home to their prior level of independence, sometimes a full recovery is not always possible. Difficult decisions and choices might need to be made. 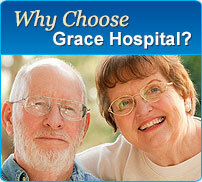 We at Grace Hospital will work with you and your loved one to reach the best possible outcome.